Every so often, we are fortunate and honoured to witness a child prodigy. Such a treasure lives, studies, performs, composes and frolics in historic St. Petersburg, Russia. 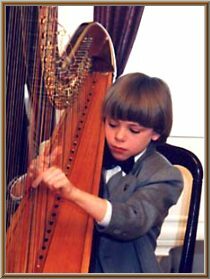 He is a young boy named Sasha who just happens to play the harp like an angel! Sasha Boldachev (b. 1990), St. Petersburg Russia, began his musical studies at the age of four at the children's studio, St. Petersburg Conservatoire, where he was taught by Lillya Mishukova. 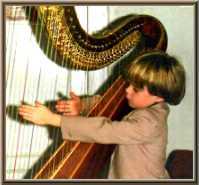 When he was five, Sasha attended a concert given by renowned Russian harpist, Olga Shevelevich. Olga is a soloist of The Mariinsky (Kirov) Theater's Orchestra, in St.Petersburg. Conservatory professor, known harpist and Olga's instructor, Asya Varosyan, placed the five year old Sasha in the Conservatory's Secondary Specialized Music School where he studied with Karina Malyeyeva and prepared for his concert debut. By age six, Sasha was a diplomat for the Children's Christmas Festival. He opened the festival with his incredible performance of Christmas Bells. This original work was written specially for Sasha by the outstanding Russian composer, Sergei Slonimsky. A truly gifted child, Sasha began composing his own music at age six. His first composition was Hurricane and the House. This was followed by On The Way to Bagdad in 1998. Chinese Tea Party was composed in 2000. Sasha's most recent composition is The Clean River, 2001. This is a considerable undertaking created in seven parts for harp, vocals, bells and instrumentals. Sasha's work is based on ancient Chinese verse. Six year old Sasha dreamed of performing at the Mariinsky Theatre. Today his professional desire is to be a solo harpist. Already, he has performed at the M.Glinka Chamber Hall of St.Petersburg Philharmonic, The Academic Chapel, The Hermitage and The Hermitage Theater, The Yusupov Palace, The Anitshkov Palace and The St.Petersburg Conservatory! His repertoire includes harp works by Bach, Ramo, Telemann, Mozart, Dussek, Grandjani, Handel, Naderman, Posse, Botayrov, Kobalevsky and others. He plays harp works by contemporary St. Petersburg composers such as Slonimsky and many others. This is in addition to performing his own compositions. Thanks to his web site, Sasha enjoyed his first foreign engagement when he toured in Lithuania, in March of 1999. Aside from his great talent and heavy schedule of practice and performing, Sasha is a normal young boy. He wants a good, new harp and a Jeep to carry it in! Sasha loves to read, watch TV and play computer games; especially strategy games. In the summer, Sasha enjoys fishing and hunting mushrooms. The Boldachev family has three cats; a grey which answers to Modya or Amadeus Mozart; a white one named Vinya (short for Vincenzo Bellini) and a black named Gosha - Johann. Sasha is a good student and learns well. He, like most boys, is always on the move, running and playing. However, when it comes time for a performance, Sasha is extremely focused and quiet. You may be curious to know the family that has nurtured this prodigy. Sasha's mother is Irina Sharapova, one of Russia's best chamber pianists and a professor at the Conservatory. She performs with renowned St. Petersburg musicians in prestigious concert halls. 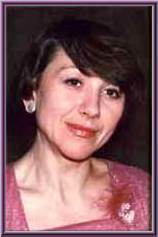 Irina specializes on vocal music and is one of the best experts on Russian classical romances. She has carried out the Anthology of Russian Classical Romances together with the singer Andrei Slavny. This project included 27 concerts, roughly 500 romances and more than 50 composers. One of Irina's projects is as a member of the new trio, Russian Virtuosi Project. Enjoy a recording of Irina and bass, Igor Gavrilov written by Sergei Slonimsky and recorded during a performance at Chamber Hall of St. Petersburg Philharmonic. Sasha's father is Alexander Boldachev. He is the originator, webmaster and designer for the web domain site titled Classical Music of St. Petersburg. This is an excellent site with a wealth of information regarding St. Petersburg's music festivals, concert halls, projects and programs and, of course, performers. Besides being a talented web designer, Alexander is an advertizing and book designer, as well as an author of computer books. In his free time, Alexander enjoys composing music, singing and playing the guitar. This is certainly a talented and active family! It has been Alexander and Irina's dream to produce an Internet project, Two Centuries of Russian Classical Romance. This project includes over fifty Russian composers; nineteenth century to the present; and many contemporary Russian classical vocalists. The Internet project is the product of an earlier project which Irina carried out in the concert halls with Baritone, Andrei Slavny. If you are planning to visit St. Petersburg, be sure to check Sasha's schedule and/or email his father, Alexander, to see if Sasha will be performing in town during your stay.